Google Voice may have its own mobile webapp now, but it doesn’t provide notifications on your phone when you get new SMS messages. Free web service GVMax solves this problem by putting full SMS support into email and IM on your smartphone. GVMax is an open source web service that allows you to send and receive SMS messages through either email or GTalk, as well as get push notifications of new SMS messages on your iPhone without keeping your computer on at home. One small problem with FreePBX/Asterisk installations is that if you deny anonymous inbound SIP calls (and you should be doing that to help keep your system secure), then any incoming calls on DIDs that don’t match one of your inbound routes will be quietly dropped, and will NOT appear in your CDR (call detail record). But maybe you’d like to see which DIDs calls are coming in on even if they are dropped, in case you have one or two DIDs that you don’t know about, particularly if you receive calls from multiple DIDs on the same trunks(s). This will write the DID of each incoming call to the file /var/log/dids. Note that if you have already changed the context statement in your trunks to point to a custom context for some other reason, you can just add the first line of the above context as a new line in that context (don’t forget to change the line number 1 to n if it’s not the first statement in the context). to create the file and then either make it world-writeable, or change the ownership to asterisk. Otherwise Asterisk won’t have permission to write to the file and nothing will be saved. This will sort the lines in numerical order and remove the duplicates. Once you have done this, you can take a look at /var/log/dids now and then and see if any pop up that you didn’t know you had. Your provider might be deliberately or inadvertently “gifting” you with an extra DID, or you might be getting charged for a DID you aren’t using! Either way, it’s good to know what’s being sent to your system. between the “TrySystem” line and the “Goto” line in the context shown above. The service is free to use while in beta (I’m not sure when it will be out of beta) and once it leaves the beta, it will cost $4.95 / month. At the time I’m writing this article, Unlocator supports 78 services, including: Netflix, Hulu, Pandora, ABC, AMC, BBC, CBS, Channel4, Discovery Channel, ESPN, Fox, HBO Go, MTV, NBC, PBS, Showtime, TV.com, VEVO, USA Network, VH1 and others. A complete list can be found HERE. While Unlocator works as advertised, there is one issue: using the Unlocator DNS permanently is not a good idea for privacy/security reasons, speed and so on. For this reason, I’ve adapted the instructions for Tunlr I wrote a while back on WebUpd8, for Unlocator. 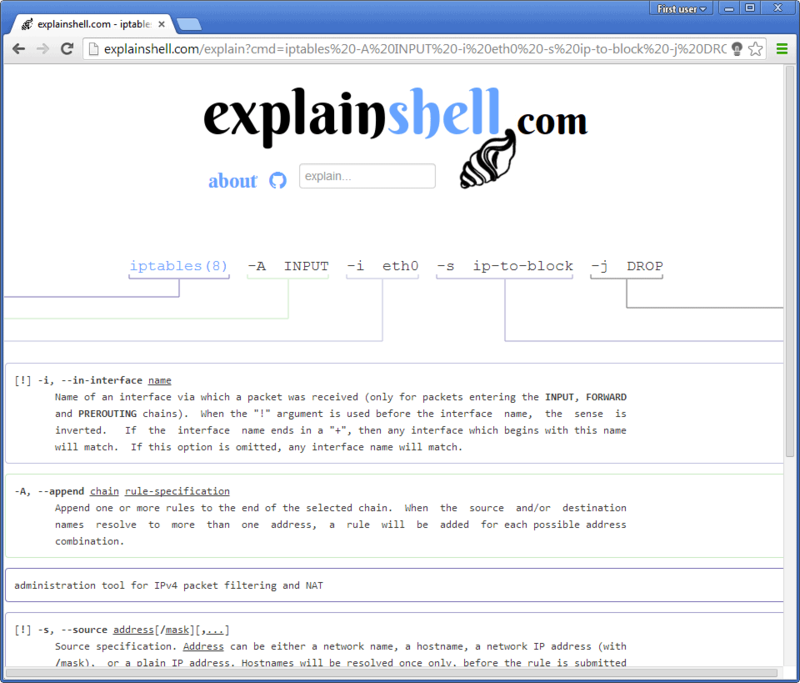 Explain Shell is a free online service that will break down command line arguments that you enter for you. If you do not know what the commands find . -type f -print0, tar xzvf archive.tar.gz or iptables -A INPUT -i eth0 -s ip-to-block -j DROP do, you can find out now using the service. Link: Linux touch command – Why do we need to change Timestamp? Posted in Linux, softwareLeave a Comment on Link: Linux touch command – Why do we need to change Timestamp? Back in the good old days, when you started watching a YouTube video, the entire thing would download (or “buffer”) in the background, thus ensuring a relatively smooth playback experience. If you had a slow connection, you could simply pause the video until you saw the “buffer bar” complete its journey from left to right. But thanks to YouTube’s switch to a new protocol (Dynamic Adaptive Streaming over HTTP, or DASH, if you’re interested), that trick no longer works. Now, when you play a video, YouTube buffers only a small amount. And that can lead to stuttering, frequently interrupted playback. If you have been a regular user of Spotify (on desktop), you should know that it caches your playlist in the local hard disk so it can quickly playback the songs without having to stream from their server again. However, if you are running low on hard disk space, you might want to clear the cache to make way for more important documents. The Spotify desktop client doesn’t come with a way to clear the cache. Here is how you can clear Spotify cache in Windows, Mac and Linux.